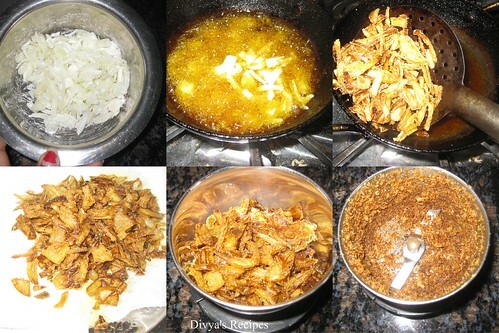 Cut onions into very thin slices,sprinkle corn flour on to of the onions and mix it then deep fry till they are golden brown color. Wash and drain mutton.Cut into cub size pieces. In one bowl add washed mutton , add yogurt, salt, cumin powder, turmeric, whole mix spices, ginger, garlic, whole white cumin, chopped coriander, mint, green chilli, all spices powder,tomato puree, fried onion powder & mix spices powder and mix it.cover the bowl and allow the mutton to marinate for 1 hour in the refrigerator. Heat a pressure cooker add marinated mutton fry for a 5 minutes .Now add 1 cup of water mix well and pressure cook for 1 whistle.Reduce the flame to a simmer and continue cooking for 20 minutes. Wait until all the pressure is gone from the cooker before opening lid. Continue cooking if you prefer the gravy to be less liquid. 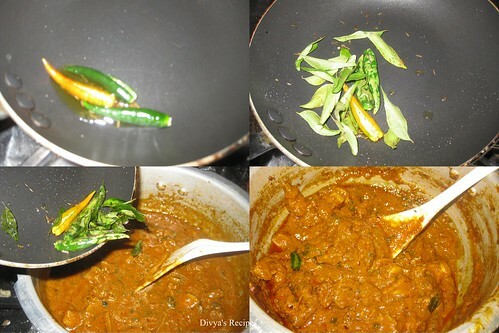 Add black cumin seeds (shahi jeera) and allow them sizzle.Add green chillies ,curry leaves .mix well and add seasoning to the mutton.Cook for 2 minutes,switch of the stove. Serve hot with rice or roti or naan. I never cooked muttom till now but it looks tempting.. Can i replace it with chicken? Please reply. 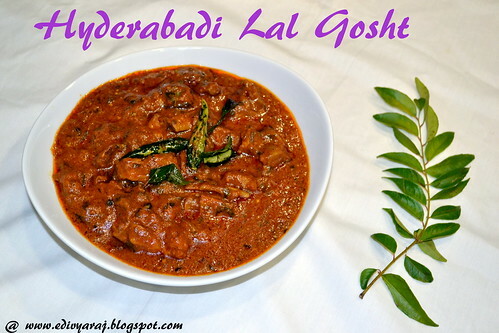 What a mouthwatering ghosht..looks very very tempting. wow looks so tempting Divya!!! hi uma yes u can replace chicken ...try u will like it.. 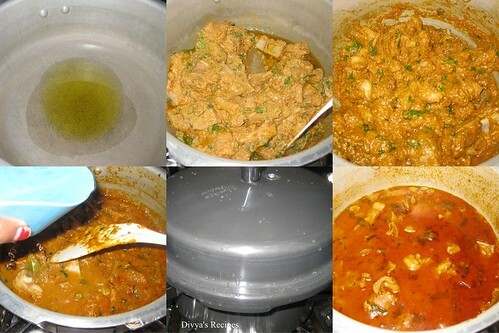 Wish I could be your neighbour Divya....ghosht curry tempts me a lot dear, irresistible..
Love the color of the Gravy dear!! Love it!! What a great job you did. Looks very tempting. Thanks for visiting my blog today. this is too much divya..looks inviting.. Loved the colour of the curry !!! ow! 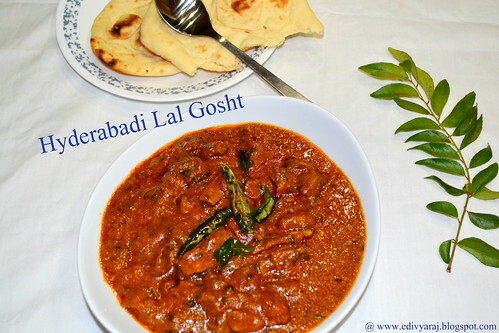 looks so so spicy and mouthwatering curry...can i use replace mutton with chicken..
Looks delicious! Very suitable for hot parathas!! 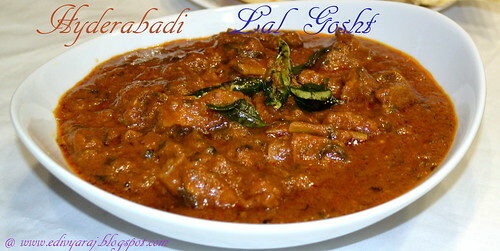 OMG..that is making me hungry now, delicious gosht n luvly color. it looks os temoting with the bright colour ! Never heard about this curry.looks so tempting.lovely colour. So delicious and yummy it looks. Love the texture for the curry. 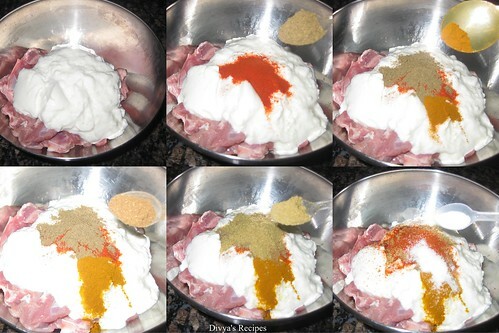 Hi Divya, your mutton dish look awesome. I might need extra rice, even with the gravy is good enough. :))Eat with dosa also very nice. 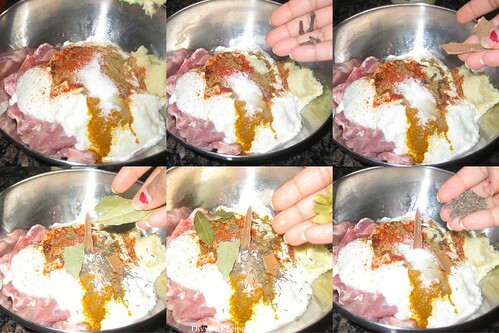 a lot of spices in this recipe, must be tasted very good! Very tasty stew! Perfect with pita bread! Hyderabad is well-known for marvelous foodies. You should not forget to taste special hyderabadi kabab. The method is simple but requires passions. 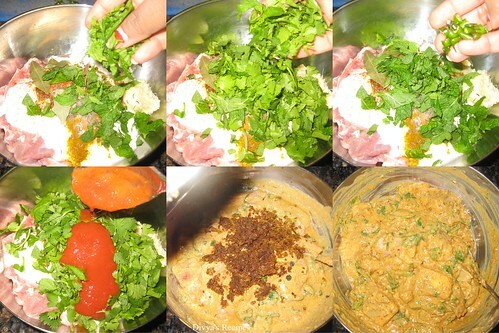 I am enjoying the tasty Indian Recipes with other members. I don't have a pressure cooker-how long should I cook this on the stove top? I do not have a pressure cooker-how long should I cook this on the stove top (and at low, med, or high flame)? u can cook till its soft n fully cooked and cook on low flame.